Do you know how was Ravana’s funeral rites performed and who performed it? Ravana, a character from the Hindu epic Ramayana, an ardent devotee of Lord Shiva, a great scholar, a maestro of the Veena (a Musical Instrument) and so on. Ever wondered how Ramayana would be, had Ravana been not what he is depicted as. In many parts of India, Sri Lanka and other Southeast Asian countries like Indonesia, he is still revered and worshipped for being a capable ruler with a scholarly bent of mind. He had written many books on philosophy, political science, and medicine at that time. After Rama killed Ravana, his queen Mandodri was upset and howling in pain due to the sad demise of her husband. She was trying to question his great intellect, his karmas, and his consequent death, and was wondering at the same time as who will perform his last rites. At this Rama spoke to Vibhishana and asked him to perform Ravana’s last rites, but Vibhishana hesitates and says that he was a demon in the guise of a brother, for all the sins he committed, for all the abduction and cheating that he was punished for and that he shall not perform his last rites. But Rama, the great speaker and intellectual that he was, explains to Vibhishana that Ravana was at the same time a great scholar and that he is equal to Rama as is Vibhishana himself. Vibhishana takes the hint and quickly begins preparation of the performance of his brother, Ravana’s last rights. He quickly gets into collecting finest logs of woods, sandalwoods, aloe-wood, carts, three sacrificial fires, and other precious stones and gems. He brings with him Malyavan (the father of his own mother) to initiate the obsequies. The entire demon clan filled with tears, placed the demon King Ravana covered in a linen cloth and started to lift the palanquin that was decorated with flags and flowers of different colors and kind, accompanied with musicians, with Vibhishana walking in front facing towards the south direction. The sacrificial fires were lit by the priests. They were put in earthen pots and placed in front of Ravana’s body. Like a Majestic King, he was, similarly were performed his funeral rites. Ghee mixed with curd was poured on his shoulders and an altar was constructed on the south-east direction to place the sacred fire. They lit the sacrificial fire, and circled around the funeral pyre and mourned his death. As per the Vedas, they sacrificed a goat at the spot and poured parched rice grains on the body of Ravana while they were all sinking in tears. According to the scriptures and ways of the world, Vibhishana set fire to his brother, Ravana. Then he washed and offered in his wet clothes sesame seeds mixed with water with blades of the Kusha grass and bowed his head to offer obeisances to Ravana. He then consoled the women and all of them returned to the city. 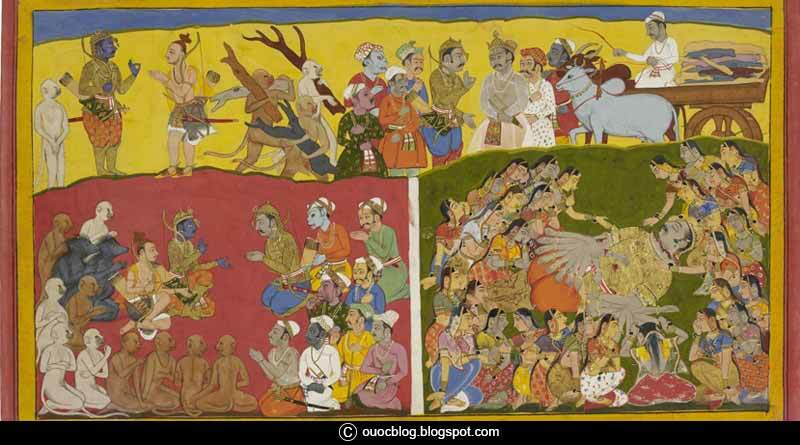 After the funeral rites of Ravana were performed, Vibhishana returns to Rama. Rama was also happy destroying his enemy along with his brother Lakshmana, Sugreeva and his army and other mates. Rama then took off his bow and arrows and the great armor that was endowed upon him by Lord Indra. Rama now sheds off his anger and maintains a charming benevolence. For more information on how was Ravana’s funeral rites performed and related updates, like and subscribe to tentaran.com.